Seasonal hiring is a great way for retailers to catch up with the increased customer demand during the holiday season. Around 20% of all retail sales of the year are generated in the holiday season alone. But to win all the business that holidays bring, retailers first have to win the best seasonal hires. Seasonal hiring — or holiday employment — accounted for recruitment of more than 525 thousand people in 2017 by the US retailers alone. Amazon hired 120,000 seasonal workers for its busy holiday shopping season. While this holiday season — or the period between Thanksgiving and Christmas — gets the cash registers ringing for most retailers, it’s also challenging for them to find great seasonal hires. But before we show you how you can find and recruit the best seasonal workers for your retail business, let’s first look at what makes finding seasonal retail help difficult in the first place. As the holiday retail business grows consistently year on year (projected sales in 2018 are expected to beat the last year’s holiday sales by 5.0-5.6%), the war for the best seasonal hires intensifies. • Lacking the skills for high volume recruiting: The holiday season pushes retailers to hire for dozens of seasonal positions in a very short period. Hiring for many positions in such a short time is called high volume recruiting, which is something not all retailers excel at. • Lacking automated and scalable systems for attracting applicants, screening profiles, tracking the applications, etc. : Most hiring infrastructures aren’t optimized for high volume hiring such as seasonal hiring. In most cases, retailers lack the right tools to promote the vacancies and streamline the full hiring process. • Lack of general preparedness: In addition to lacking the skills and the right tech stack for seasonal hiring, many retailers do not even have a proper general plan. This often results in posting ads for the seasonal jobs a little too late (with the competitors already snagging all the great hires), writing fuzzy job descriptions (thereby inadvertently discouraging qualified candidates from applying), and lacking a proper seasonal hire onboarding process (losing out the ‘hired’ seasonal staff to the more prepared competitors). However, you can overcome your challenges with a carefully crafted seasonal hiring plan. First things first, take the time to evaluate your seasonal hiring needs well before the holiday season begins. To start with, ask your current employees early on about how many of them would be able to take up extra shifts (and how many extra hours and days they can support you with). Once you know how much additional help your existing employees can offer, making estimates how many new seasonal workers you need will get easier and more accurate. Also, pick a calendar and mark out the holiday season, highlighting the days when you see the most people coming to your store. Look at your in-store traffic from previous years to pinpoint the days with the heaviest traffic. This will help you plan your hiring even better. This step is crucial to successful seasonal hiring. Start with determining how many seasonal workers you’ll need to help you with the period between the Thanksgiving weekend and Christmas. Then, you are ready to follow this guide. A great way to get a head start in the seasonal hiring game is to start with your holiday recruitment earlier than your competitors (or the local retail businesses trying to attract the same local seasonal workforce as you). For example, for the upcoming 2018 holiday season, the beginning of fall is a good time to start recruiting. Approximately two months away from Thanksgiving and the holiday season, there’s a good chance that the majority of the seasonal workforce starts searching for their gigs in that period. If you want to confirm the timing, just look around and see if your competitors or the big players have already started with their seasonal recruitment drives. Check the local newspapers and see if they’ve posted ads for seasonal jobs. If the local retail businesses in your city have started recruiting for the holidays, so should you. Writing clear and concise job descriptions is the key to attracting the right candidates — this applies to seasonal hiring as well. When creating job descriptions for your seasonal positions, always clearly mention the role and responsibilities, the number of hours or days needed, working times, and the hourly pay. It’s very important to provide all these details because a lot of seasonal workers are either college students or already have other full-time or part-time jobs. Providing all the information upfront, you ensure that only people who are content with your offer apply. Here are some very handy job description writing tips you can use for your seasonal hiring needs. Seeking referrals from your current employees to fill any open positions isn’t just one of the best ways to reduce your time to hire but also a great means to find the talent you need for your seasonal hiring. Let your employees know that you’re starting with your seasonal hiring and ask them to refer any good candidates they might know. You might even create a referral bonus scheme for employees who refer successful hires. One key strategy for great seasonal hiring is to understand the demographics that actively seek seasonal jobs. Once you understand who these people are, writing appealing job ads, persuading them to apply, and getting them onboard will become much easier for you. So what do the seasonal workforce demographics look like? Well, the seasonal workforce for your retail business can include anyone right from college students looking for seasonal gigs to retirees looking for a temporary, part-time holiday job. Or, even stay-at-home moms looking to make some quick cash by working a few hours each day. • Marketing on social media: There are many groups on social media platforms (especially Facebook) where seasonal employees hang out and share job details with each other, so find and join a bunch of these. • Publishing ads in local newspapers: The most traditional and straightforward way to reach your local seasonal workforce is to publish ads in your local newspapers. Because seasonal workers are always looking out for such ads during holidays, you’ll likely get some excellent responses. • Promoting ads on online portals: Online portals like Indeed and Monster are also very popular with the seasonal workers, so post your job ads on them, emphasize your location and you’ll be able to tap into a database of thousands of your local seasonal workers. Another great way to find and connect with great seasonal employees it to visit the places where they hang out. These places could be college campuses, matches, health conventions, or any meetups in your city. 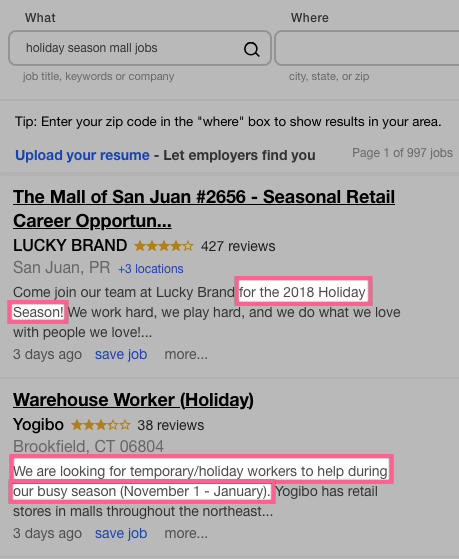 In addition to these, you should also add SEO-friendly job descriptions to your careers page, so that your local seasonal workforce can find you when they look online for any local holiday work opportunities. If your hiring team consists of just a few people, the chances are high that they will struggle to keep up with hiring for the multiple seasonal vacancies in such a short time. Perhaps, your hiring staff might not even be trained for such high volume recruiting. Here’s where supporting your team with a few freelance seasonal hiring consultants can help. You can check out websites like Upwork that have hundreds of talented hiring folks. Or, you can also hire local, freelance HR people who can visit your premises to further speed up your seasonal hiring process. In addition to hiring extra recruiters for your seasonal hiring, you should also invest in a tech stack that supports high volume recruiting. There are various tools you can use to save time in different stages of the recruitment process. • Sourcing: Sourcing talent for seasonal hiring is no different than sourcing talent for regular hiring. Which means, different sources like talent databases, current employees, job ad platforms, professional networking platforms, offline events all act as excellent talent sources. But because high volume recruiting happens at such a massive scale, you need a talent sourcing solution that works with all your talent sources, so that you don’t lose any qualified candidates. • Screening: High volume recruiting like seasonal hiring often requires screening of thousands of resumes and applications within days. Because the screening needs to happen on such a big scale (and because the time is so limited), manual screening methods fall short. What’s helpful in this case is an automated screening solution that can run screening tests with the thousands of applications and filter out the best potential fits. • Tracking/Monitoring: As seasonal hiring involves the application, screening, and evaluation of hundreds or thousands of applicants, a good applicant tracking system lies at the heart of it. A comprehensive candidate tracking solution is the linchpin of your seasonal hiring campaigns. It will make sure that no applications get lost in your hiring process. Depending on the size of your business, you might need anywhere between just a few part-time seasonal workers or a full-blown full-time seasonal workforce. In both cases, chances are that you’ll attract hundreds of applications (given that a job typically attracts 50+ applications). That means manually processing all the applications and doing the selection process to invite shortlisted candidates for the interview can take up months. This amount of time is something you don’t have at your disposal as seasonal hiring has to be super-quick. To make this happen, you can use a pre-employment testing software. It will help you to test your candidates for various skills needed for the job and evaluate their performance automatically. You can easily compare the applicants and create a shortlist of the best matches for the role. A pre-employment testing tool can help you test various skills and qualities, and calculate the overall matching score of each candidate. As all the retailers in your area are trying to attract the same local seasonal workforce, the seasonal workers get a lot of options to choose from. Which means, if you hire them but fail to give them the great onboarding experience they deserve, they’ll likely sway to some other retailer that is more prepared to get them onboard. Of course, the onboarding of a seasonal employee will be different from a regular employee, which means you need to create a specific strategy that focuses on the relevant paperwork, policy education, and job training for the seasonal hires in a short time period. You can use these excellent tips for onboarding seasonal hires. Once the busy end-of-year sale season is over, find ways to stay in touch with your seasonal staff. For instance, store all their contact details including their emails. And then reach out to them throughout the year. If possible, try sending them coupons or discounts from time to time. This way, they’ll be all primed to hear about your seasonal hiring opportunities when you need them for the next holiday season. Remember that when it comes to seasonal hiring, timing is the most important. So if you’re a retail business, start sooner rather than later, possibly sooner than your competitors. Have your seasonal hiring plan ready and make sure you have all the necessary tech resources at your disposal. Not only will this make it easier to keep track of all the applications but it will also save you the precious time in the screening and selection processes. Now go get the best seasonal employees and make the most of the holiday season! Employee Attrition vs. Employee Turnover: What Are These Metrics About?